Rice cooking is a long tradition in the East Asia. In fact, rice is the main ingredient in most daily meals for eastern family. It is similar to pasta, bread or any wheat-products for the Western counter parts. Have you ever try a rice dish at an oriental restaurant, or if you’re interest in the Mexican yummy dish and want to bring it home? Cooked rice could go together well with any sort of entries and varieties. It’s a fairly simple cooking procedure that anyone can do and the final product should match or even better than what you have tasted in that exotic restaurant. 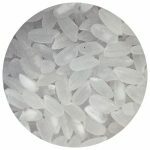 If you already know about the rice varieties and how to treat them, then skip on to the practical procedures on how to cook white/brown rice perfectly at the very bottom of this topic. Otherwise, let first familiar ourselves with some basic, before getting onto the pot and pan. 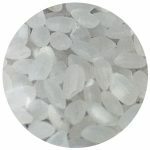 Come in many shapes and colors, from fully mill to unmilled, rice is typically classified as three types: long, medium, and short grained, each will yield a different result in taste, scent and texture. 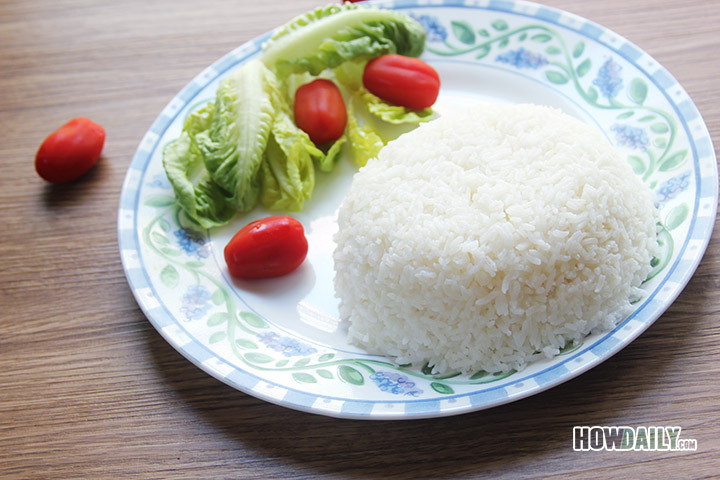 Long-grain rice is slim, slender very long compare to its width. It includes long-grain white rice, brown rice, Basmati, and Jasmine rice. 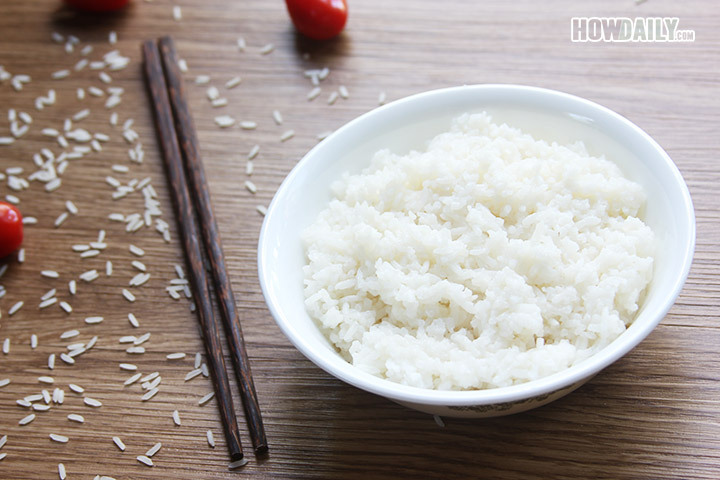 Long-grain­ rice has a firm and dry texture, tend to remain intact after cooking. It is best for side dishes with other protein/meat entries, pilaf and salads too. Medium-grain rice is shorter, kind of chubbier in shape, and after cook become stickier, moist, chewy compare to long-grain type. It includes Arborio, Valencia and Bomba rice, mainly used for risotto, and paella dishes. 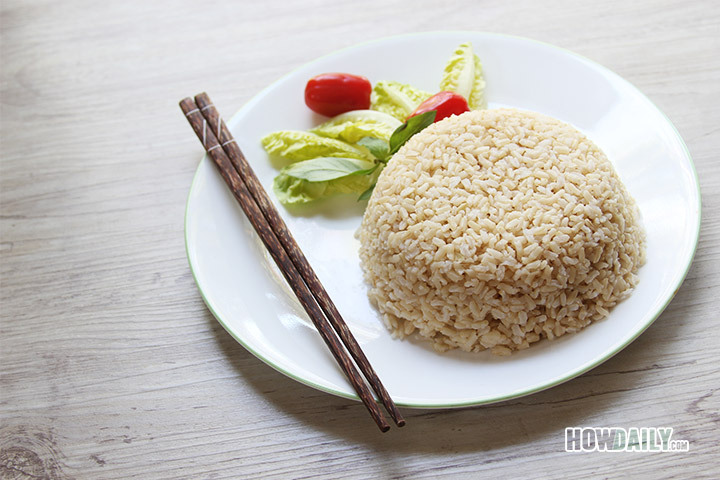 Short-grain rice is short, its length is just a tad bit longer than its width. Many could make substituted between the medium and short grain types due to their similarity. It cooks soft, tender, sticky and a bit sweeter than the above two types. This grain type is a perfect call for sushi, onigiri, and other Japanese rice dishes. It is also great for molded salads and rice pudding. In most South East Asia countries, rice is typically rub and rinse twice before cooking to remove excess starch, dirt, or other foreign objects/contamination. In the US, most of the rice, both domestic and imported are usually clean and free of dirt, mine and safe to some degree (usually through extra UV light/ray to disinfect from parasite/pest). Domestic rice also fortified with mineral and vitamins, thus too much rubbing/rinsing will result in nutrient loss. Though if this is not your concern and firmer texture/shape is your desire, then a rinse or two won’t hurt. Note that the rinse-off water, in this case, will contain lot of vitamins/minerals and starch, one of the best solutions for your face/body skin care desire. Another pre-treat method is to soak the rice to reduce stickiness and decreased cooking time. Soaking also help expanding the grain itself, and thus enhance its texture. So, after familiar yourself with some type of rice and its preparation processes. It’s time to get yourself to some cooking. The procedure is fairly ease to do and took up less time than you think as you could multi-task when the rice is cooking too. If you have an electric rice cooker, than, everything is fairly simple, just prepare the rice, put in enough water and let the rice cooker does its magic trick. Well, some rice cookers are better than most, hey, you can’t expect a $20 generic rice cooker to cook as good as a Tiger/Zojirushi brand name right, but still, it makes rice with not so much effort on your part. 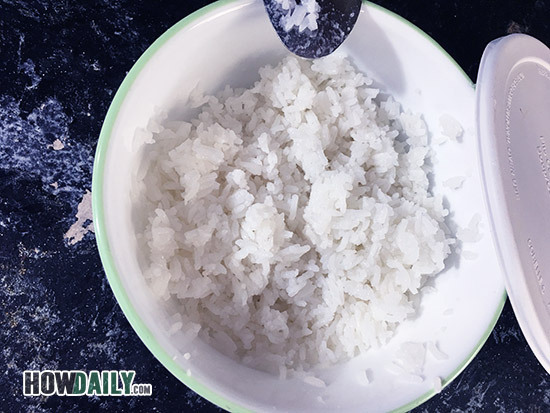 Now, if rice is not part of your daily main dish, and you just occasionally make one or never have before, then obviously you don’t have a rice cooker. Don’t worry, as long as you have a pot or pan and a stove top, be it electric or gas or wooden log, you will be sure to cook up some good rice, and an extra great appetizer dish too (I will talk about how to make use of this extra dish, yum). Generally, rice is cooked through water absorption and boiling/steaming methods. In some countries like Iran, Afghanistan or India and Pakistan, rice is quickly fried in fat before boiling/cooking to remove stickiness. 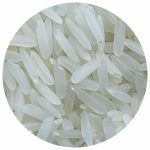 Since the boiling the rice will mostly remove all the enriched vitamin and nutrient and thus make the rice more undesirable, this article will mainly focus on the water absorption procedures on both White and brown rice. Cooking is an art, and so does making rice. Before getting to the pot, you have to know about your desired outcome, as in what your recipes/dishes called for. Knowing that, then with some of the given guidelines above, you would be able to control the level of stickiness, texture, moist, sweetness, etc. all of these will contribute to that perfect rice dish. For example, a combination fried rice would require the cooked rice to be somewhat firm, no sticky, dry and intact grain shape, while a rice pudding would be somewhat sweet, soft and super sticky. Understand your recipes first, then adapt what you read and adjust these below procedures to meet your need. Each raw rice cup = 3 cooked rice cups. Longer pre-soak time = less water need to add + less cook time. 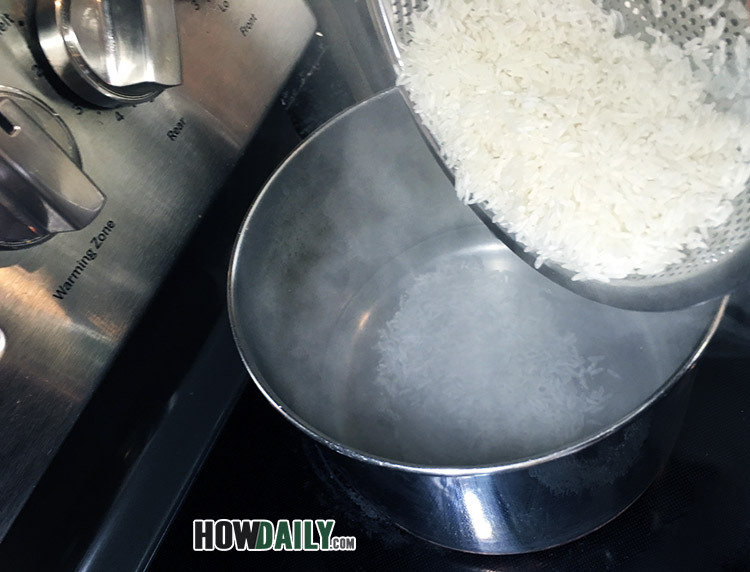 Rice could be boil, steam or cook with water. When cooking using electric cooker, it typically require extra half cup of water for each cup of rice/water being cook. 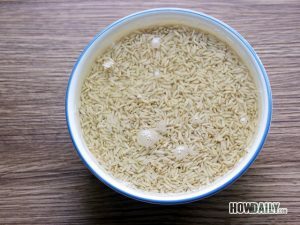 That is, if you cook 1 cup of rice, then 1 and ½ cup is needed, if you cook 3 cup of raw rice, then 3 and ½ cup is needed. Or you could use your hand, the water level should be ½ inch above the rice level. When cooking brown rice on stove top, a pressure cooker is needed to reduce time and energy consumed. Newer harvested rice requires less water than older crop when being cook to produce similar texture. Newer harvested rice also smell better, and required less time to cook/soak, so pay attention to the manufacturing date when you buy them. You could add small amount of salt, oil or butter when cooking to enhance the rice flavor, this is essential when cooking older rice. Brown rice, in general contain less bad carb, and thus fit more for people with Paleo or Atkins diet compared to white rice. Sticky (Gluttonous) rice is a special rice type that have extra stickiness and contain event more carb then traditional white rice. Cooked rice can combine with any type of dishes include fish, meat, poultry, seafood, vegetables. 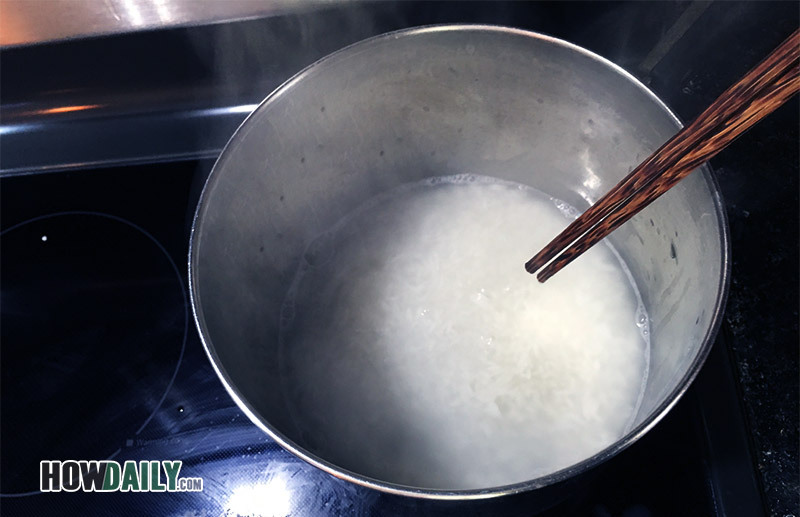 Cooked rice can be made into congee (rice porridge) by simple adding more water and cook for extra time. Like chicken noodle, congee is a common food in the East for the sick or elderly. 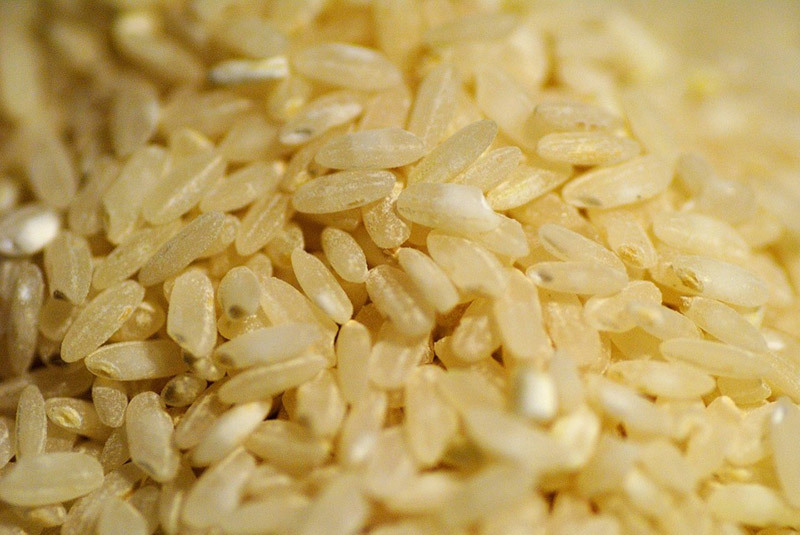 Rinse-off water from rice can be used as skin cleaner or moisturizer, so save it. A decent rice cooker is not cheap, but could perform far more than you could imagine: from tradition rice cooking, brown rice cooking, congee, steaming, and customize for some baking recipes due to it all over well-round distributed heat and pressure maintaining capabilities. If you don’t have a rice cooker yet, instead of getting those cheap one, try the cook top, it’s harder and more effort, but the result is way better than from those cheapies. 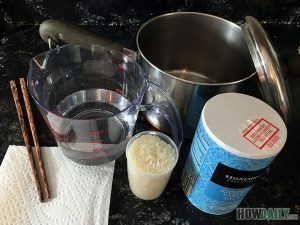 Store you uncooked rice with a cup (so you don’t have to look for one every time you cook), an empty condense milk can will do. Most, if not all, East/South East Asia consume rice in their meal every day, they have quite a bit of nutrient values while being fulfillment. However, white rice is a definitely no-no to diabetes patient. They, instead consume product made from rice that has lower carb content. Tea: you could also cook rice with diluted tea instead of water to enhance its scent and colors. This is also very good for your digestive system too. Following are several rice cooking methods that fit most of the recipes that call for cooked rice. 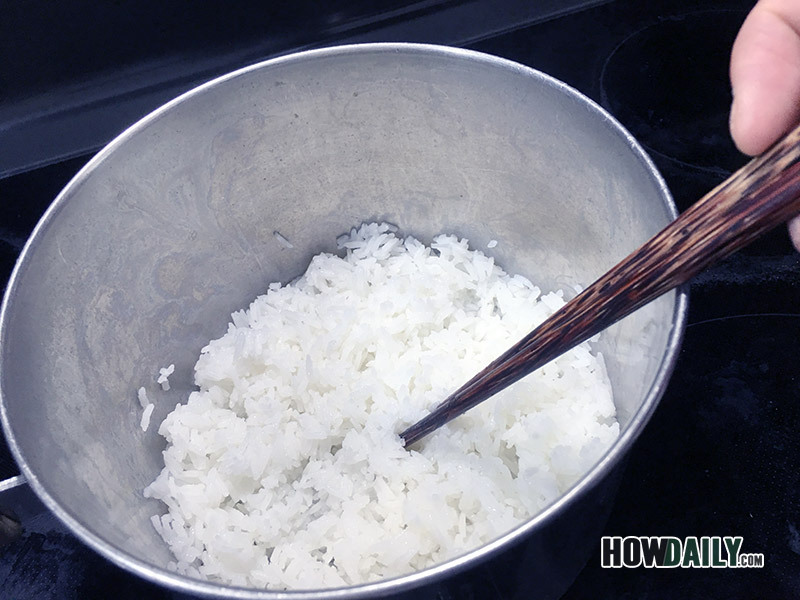 This procedure introduce a fully proofed way on how to cook white rice perfectly every time using your own pot and stove top, no electric cooker is needed. It’s noted that optional condiment or ingredient could be added to enhance the rice flavor/looks per your main dish recipe calling. 1 Rinse: fill the rice with water, gently stir, then rinse off, do not rub as this may unnecessarily remove the rice nutrient and vitamins. 3 Place the pot on the stove top, cover and boil the inside water. 4 When the water is boiled, add rice. 5 If you want to add those optional ingredients, add them now, and stir. 6 When the rice/water combination is boiling, turn the heat down. 7 After 10-15 minute, when most of the water was apsorped, turn off the heat source. 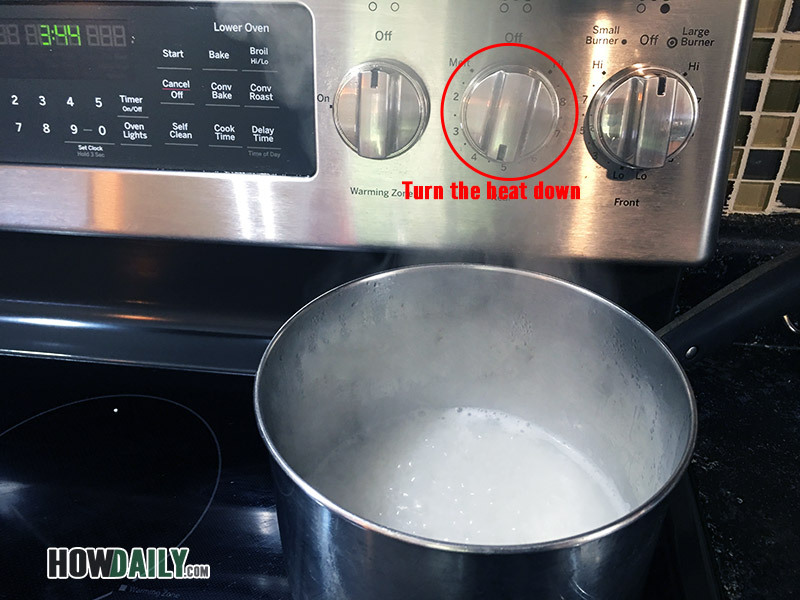 Keep the cover in place, and get the pot/lid away from the heat source for about 10 minutes. 8 Now gently stir your cooked rice, remember do not stir to the very bottom layer, unless you like the burnt smell all over your rice. Replace the lid and let it sit until being served. Rice too soft/mushy: open your pot to let the moisture out, stir the rice. 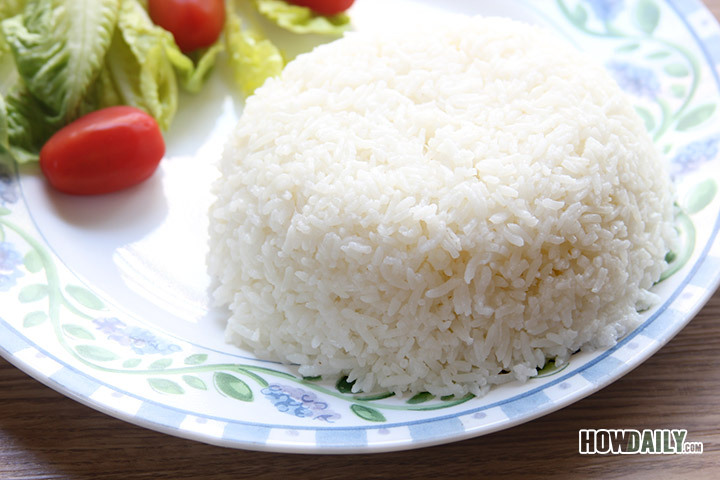 If it’s still too mushy, place all your new cooked rice on a plate to let it cool down. This will help to remove some excess water. When it’s time to serve, just place the whole dish in microwave to heat it up. Rice half cooked/undone: if your rice feel like it’s half done, you could try this method. Use a wooden spatula to stir and segregate all the grains apart. Then in a 10:1 rice/wine ratio, add in cooking wine into the pot and heat at low power. When the rice is done, all the wine will be evaporated and no extra moisture is left. 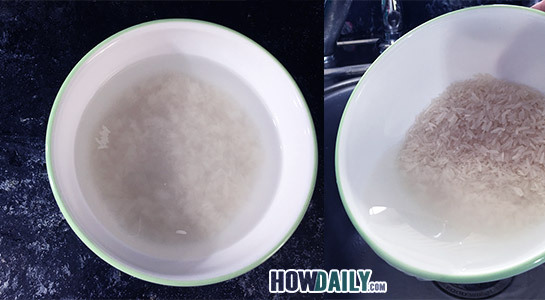 Put some cold water in a small bowl, then place the bowl in the middle of your pot, press it so that the bowl top is level with the rice top layer. Close the lid, and let sit for 2 minutes, the smell should have gone. Add 3-5 green onion into the pot and replace the lid, this should help absorb the smell too. Place a piece of bread on the rice and replace cover for 5 minutes, then remove the bread. All cooked rice should be consumed when finished for full texture, scent and flavor. Leftover should be cooled down fully, wrapped before refrigerated. Cold leftover cooked rice is perfect for fried rice or congee recipes. 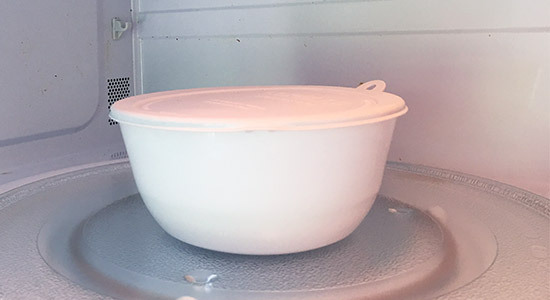 To warm up the leftover rice, you could microwave it while being wrapped or the best way is to put it back in the electric cooker (if you have one), add in small amount water, cook for 10 minutes, then stir and close the cover, turn back to warm. The rice should be back to it soft and fluffy state. When cooking on stove top, a harder golden-brown layer of rice will be formed at the bottom of your pot, be it non-stick coated or not. Don’t discard this layer, as it could be fried, roasted, dried, etc…and make a very good snack for your guests. Clay pot: If you happen to have a clay pot in hand, why not use it to cook your rice. In fact, clay pot is the best type to cook rice; the result will be fabulous and smell wonderful. Just remember to add less water, 1:1 ratio, and to heat your pot slowly. It took twice as long to cook rice in the clay pot though, but the result is so much different that you won’t want to look back. Vinegar: In the summer, when it’s hot and humid, it’s best to add in 1tsp of vinegar or lime juice to your rice after rinsing and before cooking. This will help the cooked rice to be whiter, and preserved its scent and taste longer too. Rice cooker has been one of the most usable small appliances in the East/South East Asia families for long. Firstly came out with just the standard feature: cooking white rice, now, rice cooker capability is so versatile that it’s become an indispensable piece to have. Rice cooker has many functionality, from the simple analog with standard white rice or brown rice cooking, to the super digital with multi-cooking features include: white rice quick cook, normal cook, multi-grain, steaming, congee, etc. Some even equipped with the slow-cooking/roasting ability. Some of the long trusted brands are Tiger and Zojirushi, both have product made in Japan, and famous for their outstanding product and its longevity. It’s very simple to cook with a rice cooker. If this is your first time, read on to find out how. 3 Measure and add water into the pot at the ratio of 1:1+0.5 rice/water ratio or at the water level on your rice cooker marks. 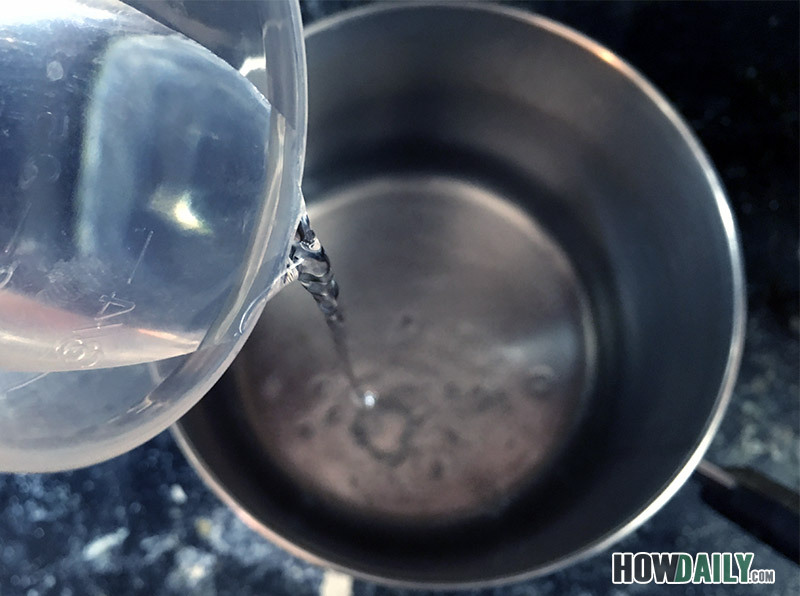 Adjust the water per your rice instruction. 4 Pat dried the pot bottom and laid it back into the rice cooker. 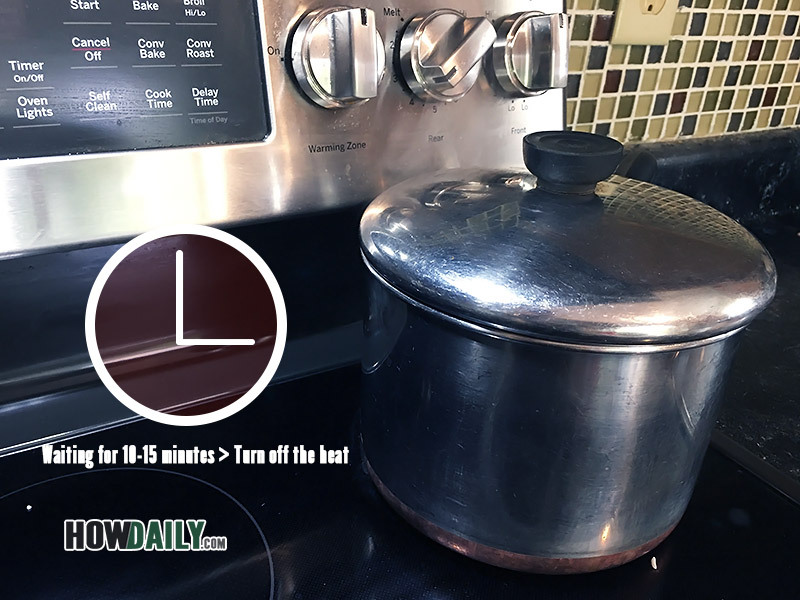 Let sit without power for about 30 minutes to let the rice soak if you have some free time, or if your cooker have a timer feature, then set it to cook after 30 minutes. Then turn on the rice cooker and let it cooks. 5 After the cooking is done, and the cooker just turn to warm, open the lid and stir to separate all the grains. Close the lid and let it be for at least 5-10 minute before serving. If you don’t have a rice cooker and don’t want to use your stove top, then a microwave could do the job as well in a short time too. It’s very important in this method that you know your microwave and your ingredient (i.e. rice to water ratio) well. All of the below is for your information, please take the measurement and adjust to your own equipments. 1 Rinse the rice with water. 2 Place the rice in the microwaveable container, fill with water, and make sure that the water level is about a knuckle of your pointer over the rice top. If your finger is long, use your pinkie instead to measure. 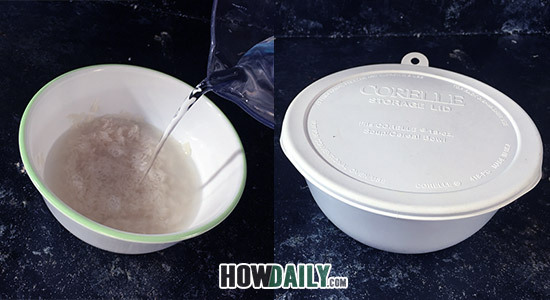 3 Make sure that your container will be large enough to hold 3-4 cup of cooked rice with space to spare. Close the lid tightly with the ventilated hole in use. 4 Microwave at high power (700W) for 9 minutes. Note that depend on your microwave wattage, the time might be varied, so adjust cook time accordingly. 5 Then cook/microwave at medium power level for an additional 3 minutes. 6 Let the whole thing sit still and rest for 5 minutes, then fluff and enjoy. Like white rice, brown rice also divided as long-, medium- and short grain. While similar in most, brown rice is actually white rice that’s in its un-milled form. That means that all of the “good” fiber, vitamins and nutrients. So let’s get your hand on some and start cooking. 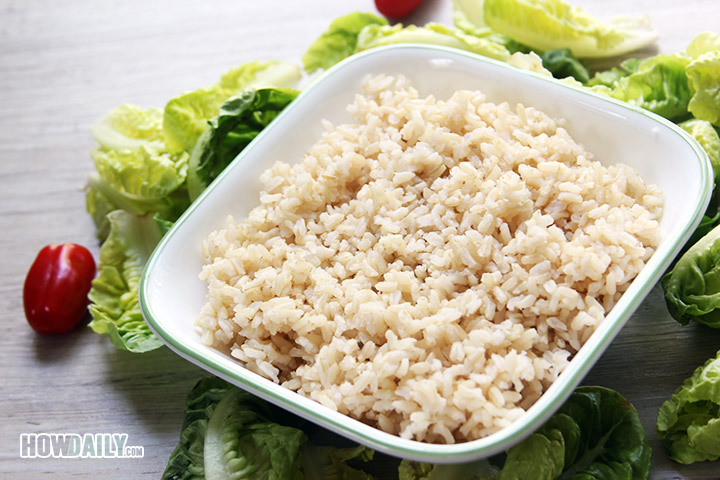 Pre-soak: soak brown rice with water at least 8 hour or overnight for to save time cooking while bring out the its best quality through activating the rice germination process. It is found through scientific study that brown rice once soak for enough time, will go through germination, a process that activates its enzyme and amino acid. If you choose to add in additional ingredient like bean to enhance the rice flavor, then you should soak those beans too. The recommend amount of bean is about 15 – 25% of the rice. 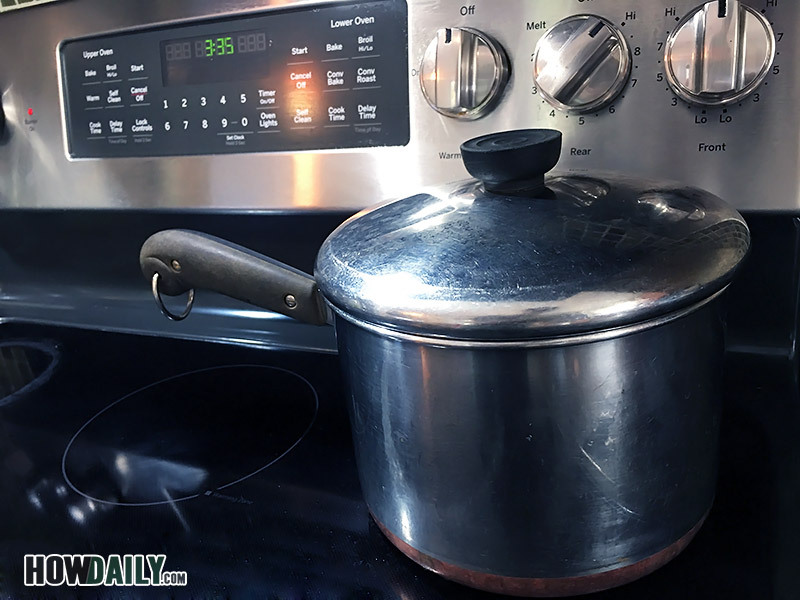 Add soaked brown rice, water, optional ingredients (bean), salt into your pot, close the lid tightly, here’s how the instruction for each type of pot differ. 1 Add an extra half cup of water into the pot, bring the whole thing to boil, and then reduce heat to as low as you can and let it simmer while being covered until most of the water being absorbed (around 40-50 minutes). 2 Turn off heat and remove the pot (while being covered) away from the heat source and let it rest for at least 5 minutes. Now use a spatula to stir and fluff it up then replace lid until served. 1 Bring the rice and liquid to boil, when the regulator come up (about 15 minutes), turn off heat. 2 Let stand for 15-20 minutes. Then turn on heat and bring back to boil second time (around 5-6 minutes). 3 Turn off heat and let stand for at least 20 minutes. Carefully open lid to check, then stir fluff and replace lid to preserve the heat until serve. This is the easiest, just load the whole pot into the rice cooker, set to brown rice cook function, and cook. If your rice cooker happen to lack the brown rice cooking feature, don’t worry, it could be use to cook brown rice with just a little modification. 1 First pop the pot with rice/water/salt/… into the rice cooker, then cook until boiling or you could see some vapor come out. 2 Turn the cooker OFF (not warm), let sit for 45 minutes. 3 Now turn the cooker ON and cook until done. When the cooker automatically turns to WARM, don’t open it yet, let it sit still and rest for another 30 minutes. Sit and fluffy with your spatula and enjoy. If you use bean in your brown rice cooking, then do add in a piece on Kombu seaweed. This will help the bean to be softer and cooked faster. Turmeric will enhance give the rice a golden look while smell great too. It’s also very good for your digestion and eases your stomach due to its curcumin source.